Sometimes, the hardest thing to do is to let go of something you once had great passion for. Taking a step back, re-evaluating, and clearing your mind will definitely help put things back in perspective. I also find that purging is often necessary to get back to what is truly meaningful. A few months ago, while planning some future renovations to the house with Darling, I started looking around at all the superfluous stuff we had just laying around. I decided that to help make space for us to work, I'd start packing any and all unnecessary items up in order to facilitate work. 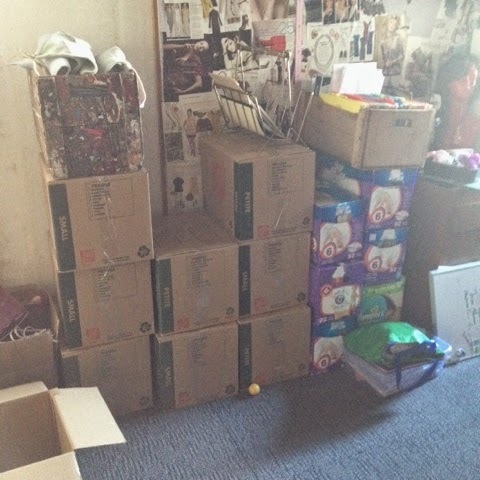 Box upon box, upon box started piling up, and filling up our storage space to capacity. 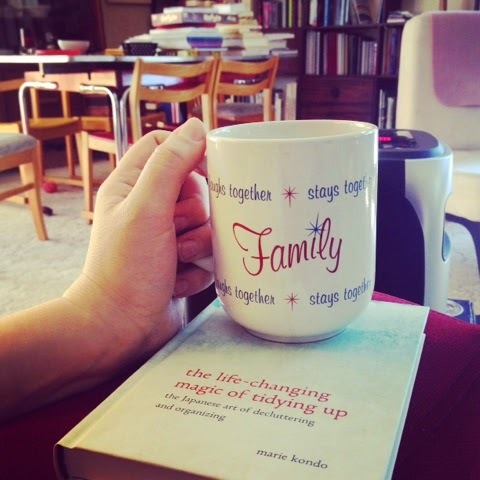 I'm talking hundreds of books, tons of clothes I was keeping (some for our youngest to grow into, some I was hoping I'd shrink back into, seasonal items...), and miscellany like lamps, vases, dishes, flatware, just general clutter one accumulates over the years, and keeps "just in case". I tried to be tough, and pack only the things I thought we really couldn't do without, but it was still SO much stuff! Then one day, while browsing (ok, stalking!) some of my favourite Instagram profiles, I stumbled on a post which mentioned a book. It was Marie Kondo's "The Life Changing Magic of Tidying Up", and I was so intrigued by it, I searched it out on Amazon, and bought it on the spot. Two days later, this little gem was delivered straight to my doorstep. I broke into the box, pulled out the book, and read it practically cover to cover that very afternoon. It was so filled with interesting tidbits and anecdotes that felt as though they were directed at me personally. The rules of the book are to read it in its entirety before starting, but I couldn't help myself. The next day, while the little one was distracted by one of her favourite movies, I started with the clothes. It should be said that my bedroom closet is not big, and, it's shared with our toddler. Most of my clothes are on hangers, but I also keep a few see-through plastic bins to keep out-of-season items and accessories, to save space. I emptied the whole closet onto my bed. Every box, every hanger, every drawer, every single item was dumped onto my bed. Seeing all of my clothing in all its splendor displayed haphazardly on my bed gave me both a feeling of pride, and embarrassment. Pride, because I could see a lot of good quality items I'd taken very good care of over the years. And embarrassment, because how could I dare look at this humongous pile of clothes, and ever utter "I have absolutely NOTHING to wear!" So I culled. And culled, and culled, and culled. Until I was faced with a discard pile so large, I started thinking I might have lost my mind. I filled eight (EIGHT!) of these 45L recycling bags, all with clothes from MY closet. Just mine. I'll tell you, the urge to keep diving back into each bag to retrieve an item or two, because I wasn't sure it didn't spark joy hit me more than once. And I did retrieve a few items, to feel them again, and even try them on. But my initial instinct always proved right. I wasn't utterly and completely in love with them. So I brought it all to the garage, where every item culled in the last 7 weeks has been sitting, waiting to be dropped off at the nearest thrift store. Next were all the books. I wish I could say that they were shared, but honestly? I'm the bibliophile in the family, and out of all the boxes you see here, two were filled with Darling's books, and three of them were filled with Mimi's books. The rest? All mine! My goal? 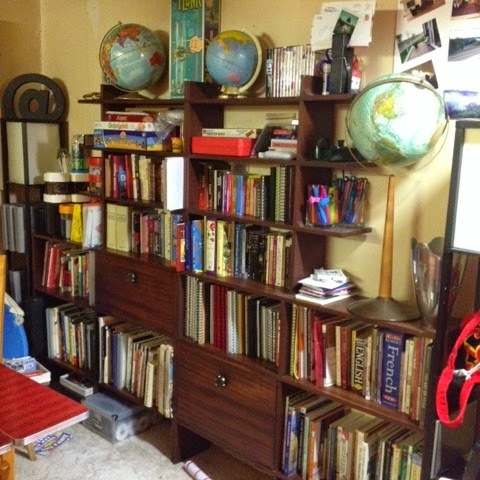 To keep just enough books to fill our existing book shelf shown below. It's not perfect yet, and there are still a few things that need a different home (like our games for family game night, and the kids' art supplies, which are kept in the closed compartments), but it's getting there. This book is changing my life! See that pile of books on our table? Those are 30 more books that I've decided to add to the donate pile AFTER purging over 12 big boxes full. Hundreds of books later, and I just keep taking more out of the shelf! It feels amazing! I literally feel lighter, happier. Even Darling has commented repeatedly how good it feels and looks. It is mind-boggling the amount of stuff we weigh ourselves down with, or hang on to "just in case". 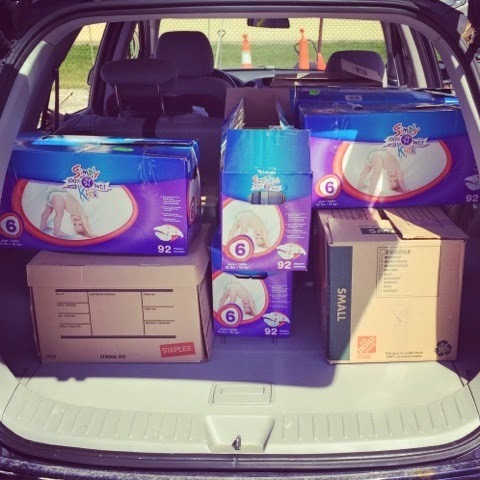 I thought of selling the books to local used book stores, or passing some on to friends, but I decided to donate them all to the Nova House, a local shelter for abused women and their children. Each year, they hold a Book Riot, where the proceeds go to supporting Nova House. Marie does not recommend purging others' items, and I wholeheartedly agree with this. As I'd hoped, the more I went through my own items, the more my family made comments on the improvements in our surroundings. Less clutter, less dust, less sneezing, more space, all of our pretty things were more visible. Darling didn't think he'd have much to go through, but he was just as surprised at how much he tossed. Even our "Oh no, I can't throw ANYTHING out!" teen embarked on the culling mission. 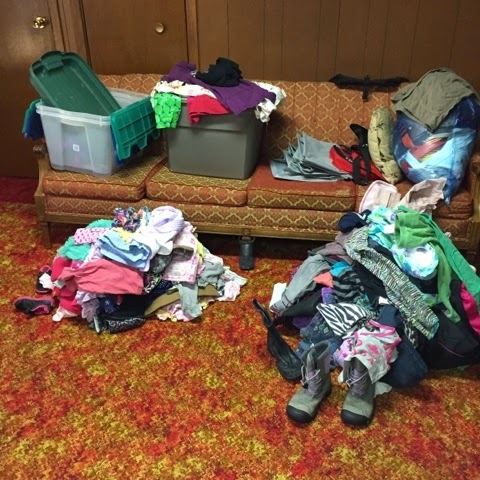 After giving her at least one week's notice, the morning we got to the task, she said "I really don't think I'll be getting rid of much Mom. I use everything". I explained that she would be surprised at the amount of stuff she no longer used, wore, or even looked at. And I was right! Oh my goodness, 4 big blue bags were filled with clothes, toys, shoes. She couldn't believe it. And once we were done, and finished reorganizing everything, she was so happy. We spent the better part of a day doing her room alone, and she now finds it to be restful and pleasant to hang out in there, even after learning how to fold her clothes in little 'stand up' bundles. She can find everything, and she loves that every item Sparks Joy. (A term she found ridiculous, but now understands). And I love that I can do the weekly vacuuming without having to go in and clear the whole floor ahead of time. I decided to do our Didi's clothes myself, since she's just (almost) 3. It was much easier for me, her primary caregiver, to know exactly what fit, what worked, and what toys I knew she still played with and loved. The big piles on the floor are now gone! 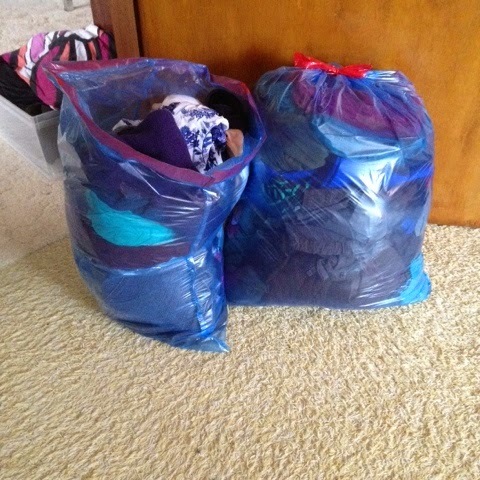 Two big bins, three big reusable shopping bags, the blue bag, and a large duffel bag: all empty! We're quickly filling boxes and large bags with items, and though at first, all we could see were dollar signs flying out the door (we thought of having a garage sale, but frankly, I'd rather not have to deal with all the stress and effort behind it, and just donate everything so that it's all out of the house), now, when I sit at the dining room table, on the couch, at my studio table, all I see are Joy Sparking items. And that's an amazing feeling. One of the things I had not expected to happen was not only the happiness and joy from the extra space, but I mentally started feeling lighter. Not just mentally, but physically as well. 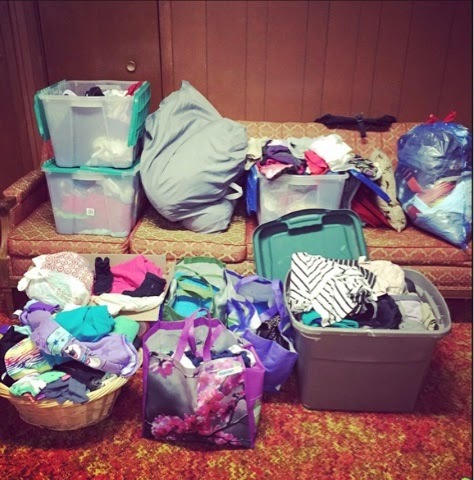 Suddenly, the clothes I kept that had a little wiggle room (I tried every single item on!) was falling off of me. Not off the bump, mind you, but sleeves and pant legs were looser. Shoes and rings too. It's like all the stuff I was hanging on to was making me hold on to that 'hard to lose' extra padding I was sporting. I thought it was all in my head, but even Darling started noticing and mentioned how I was shrinking. Not a bad deal if you ask me! LOL! I'm loving this new feeling. A feeling of newfound freedom. Freedom to say no to family who'd like to pass on generations-old furniture or dishes. Freedom to let go of old items that no longer serve their purpose. Freedom from the guilt in thinking "but I paid so much for this!". Freedom to surround myself purely with things that Spark Joy. I'm far from done, but getting closer and closer to my goal of a purely minimalistic look each and every day.